Hope you all had an epic Thanksgiving holiday! I'm hoping you dog showed it up, ate lots of turkey, Black Friday'd or Small Shopped Saturday'd (if you're in that), binged Gilmore Girls, and generally relaxed. And speaking of Gilmore, can we talk about it? I know, I know, spoilers, so if you want to talk about it, email, text, FB/IG/anything message me. I'm sitting here like, wait I kinda, sorta, really hated Winter, Spring, and Summer, and then WTF Fall and it's over. And now, I just want to talk about it. Lol, but really, so get at me. Speaking of Gilmore Girls, CUPCAKES. Because cupcakes cure all, right? Especially when they come straight out of what I like to call one of the greatest baking books of the year, Sarah Kieffer's The Vanilla Bean Baking Book. Sarah is pretty much the queen of baking, so anything she says or does, I'm like yes. Her book is all about everyday favorites and reinventing the classics and I'm all about it. Take these cupcakes for instance. Her method of dropping in the butter piece by piece into the dry ingredients vs. straight up creaming it, both scared and intrigued me, and in the end, I said, 'yes, queen, anything you say' and ran with it. Of course, my cupcakes came out perfectly light and fluffy with the perfect crumb. And then, her brown butter buttercream, has both heavy cream and cream cheese and is pretty much the creamiest non-meringue buttercream on the planet. Gold. I'm obsessed with this book and bottom line, I think Sarah's a genius. Ps - We (Moses and I) are scheduled to go to the Wizarding World of Harry Potter tomorrow and I'm so excited I'm not sure I'll sleep tonight. Ok, who am I kidding. Of course, I'll sleep (and nine hours, no less) but YAYYYYY. Adjust an oven rack to the middle position. Preheat the oven to 350°F. Place liners in two standard 12-cup muffin tins. In a medium bowl or liquid measuring cup, whisk the eggs, egg yolks, vanilla, sour cream, and buttermilk. In a bowl of a stand mixer fitted with a paddle, mix the flour, sugar, baking powder, baking soda, salt, and ground cardamom on low until combined. With the mixer running on low, add the butter one piece at a time, beating until the mixture resembles a coarse sand. With the mixer still running on low, slowly add half the wet ingredients. Increase the speed to medium and beat for 20 seconds (the batter may still look a little bumpy). Scrape down the sides and bottom of the bowl, and use a spatula to mix the batter a few more times. Fill each up a little more than halfway full. Tap the pans gently on the counter 2 times each to help get rid of any bubbles. Bake 16 to 20 minutes, until a wooden skewer or toothpick inserted into the center comes out clean. Transfer the pans to a wire rack and let cool for 30 minutes. Gently removed cupcakes from tin and place on the rack, and let cool completely. Once cool, the cupcakes can be frosted. Melt the butter in a light-colored, heavy-bottomed skillet or saucepan over medium-low heat. Swirl the butter around with a rubber spatula as it melts and starts to bubble. When it starts bubbling, increase the heat to medium and keep stirring the butter until it boils and begins to foam, 3 to 5 minutes. It will smell nutty and you'll start to see little brown bits on the bottom of the pan. Keep stirring, making sure to gently scrape the bottom of the pan with the spatula as you do. Ad this point, the butter will begin to quickly change from light brown to dark to burned, so keep a close eye on the pan. Once it is golden brown, remove from the heat, and pour the butter and any bits or flecks on the bottom of the pan into a heatproof, freezer-safe bowl and let cool for 10 minutes. Then place the bowl in the freezer and let chill until solid, about 30 minutes (you can also put it in the fridge to cool, but it will take a bit longer). When the butter is solid (but not frozen! ), transfer it to the bowl of a stand mixer with a paddle. Add the remaining 1/2 pound of butter to the brown butter and beat on medium until smooth. Add the cream cheese and beat on medium until smooth and creamy. Add the heavy cream, vanilla, and salt and mix on low to combine. With the mixer running on low, slowly add the confectioners' sugar and beat until combined. Increase the speed to medium-high and beat until light and fluffy, stopping to scrape down the sides of the bowl as necessary, 6 to 8 minutes. 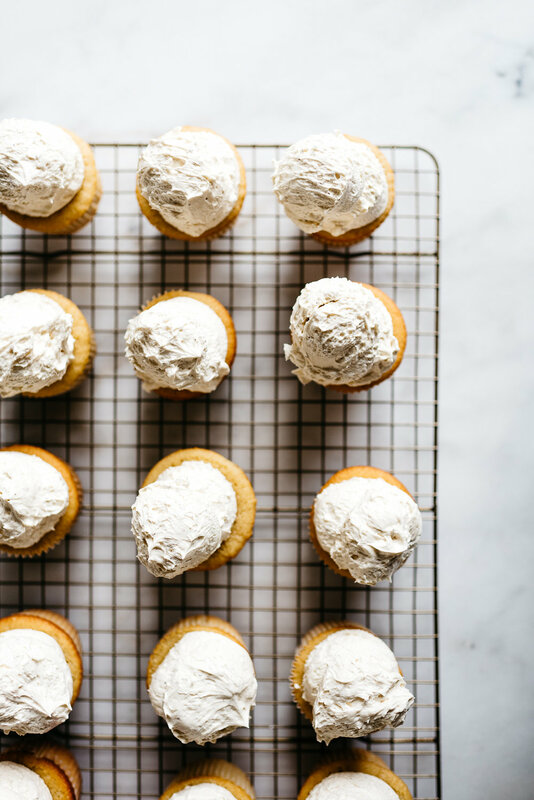 Using an offset spatula, spread the top of each cupcake with a heaping layer of buttercream. Notes: I'd recommend browning the butter before you start baking your cupcakes. Also, I used a disher, size 30, to mound 2.5 ounces of buttercream onto each cupcake.